Dilma Rousseff, the Terrorist: Will She Be the Next President of Brazil? Will She Be the Next President of Brazil? From Brazil I am a regular reader of your website. I agree with your anti-Communist stands. For this reason, I want to bring to your attention and to that of your readers that in the run-off of the elections for president of my country, which will be on this coming October 31, there is a serious possibility that Dilma Rousseff will win. Who is this woman who had never run in an election before? She has grown in importance nurtured by the leftist power. 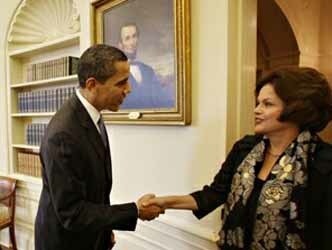 She first was invited to be a Secretary of Energy in the State of Rio Grande do Sul, and then invited to be Minister of Energy in Lula's government. In 2005 she left this function to become Lula's Chief of Staff. Now she is running as the candidate for president. This woman has the most radical possible past. She is the daughter of a member of the Communist Bulgarian Party who immigrated to Brazil for political reasons. In her early youth she joined Communist groups and became a guerilla leader. At age 21 she was already participating in bank robberies to fund guerilla activities. After one of these actions, the police found the group's meeting place and invaded it. The members received the police with machine guns and two police officers were killed. 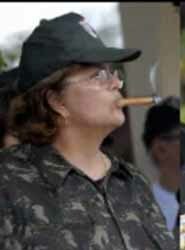 In 1968 she was important enough to dispute with the famous Communist guerilla leader Carlos Lamarca for the leadership of the Palmares Revolutionary Armed Vanguard [VAR Palmares], which was one of the most violent groups of our history. I am sending to you pictures of some of its victims murdered in terrorist attacks at that time. In that dispute over the future of guerilla movement, the group split, and among the 37 leaders present, 30 of them stayed with Rousseff and only 7 went with Lamarca. 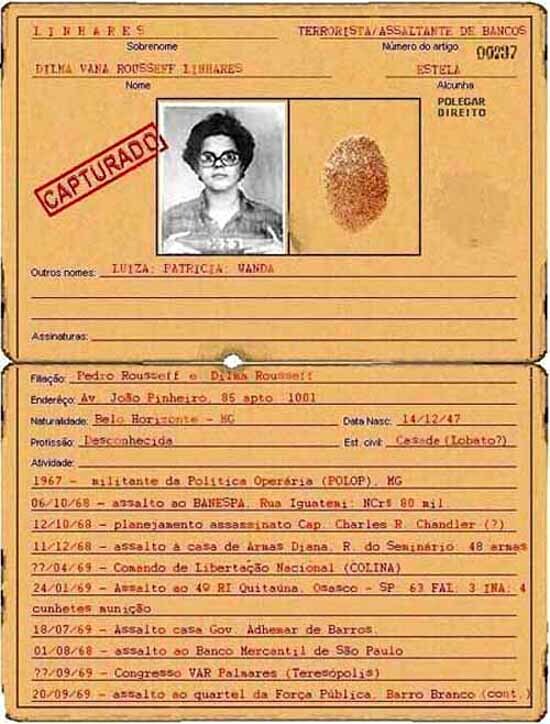 She, along with two successive lovers, planned many of the group's actions - including the robbery of the house of Ademar de Barros, governor of the State of Sao Paulo, the break-ins of military headquarter and gun shops to steal weapons and ammunition, and a frustrated attempt to kidnap Brazil's Treasury Minister Delfim Netto. She was arrested by the police in 1970 and condemned to 6 years in jail. After 3 years, however, her sentence was shortened and she was released. In her campaign for president she has become famous for her lies. Among them is the denial that she took up arms. I am sending you the first page of a police report made when she was captured. 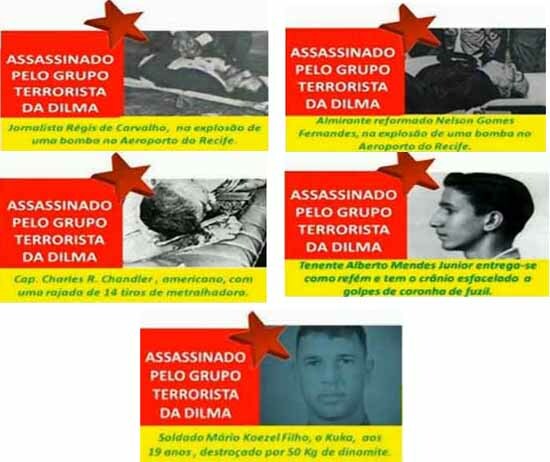 This document was published by Folha de Sao Paulo (July 5, 2009), which is the largest circulation paper in Brazil and a very serious media organ. Rousseff, then Chief of Staff, asked the paper to reveal the source, and since the paper did not, she claimed it was a forged file. Nonetheless, all the data that appear there have been confirmed by other sources. I ask you the favor to post this note and the corresponding documents on your website with the hope that, by influencing your American readers, their opinions may boomerang back to Brazil and help prevent the disaster that would be her election. This is the person the Catholic Bishops are supporting as you pointed out recently. May Our Lady of Aparecida, Patroness of Brazil, enlighten the minds of the Brazilian people to vote well and sharpen the eyes the international election watchers to prevent a huge electronic fraud.